This modern take on Patricia Highsmith's famed STRANGERS ON A TRAIN is a pulsating thriller of betrayal and love skewed, with plenty of extra twists to its tale. Swanson keeps the tension high, even as he switches perspectives between characters, and throws in some exquisite curveballs, taking the story beyond where you think given its set-up and initial hook. But this isn't just a well-plotted high concept book full of action and suspense - Swanson threads in some lovely prose and nuance, along with good depth of character to elevate THE KIND WORTH KILLING above most other big-name 'domestic suspense' and psychological thrillers out there. "Truthfully, I don’t think murder is necessarily as bad as people make it out to be. Everyone dies. What difference does it make if a few bad apples get pushed along a little sooner than God intended? And your wife, for example, seems like the kind worth killing." The hook is set early, as a man and woman meet at the airport bar in London, and their conversation takes a darker turn. Ted confesses his wife is cheating on him with a contractor working on their mansion, and jokes he'd like to kill her. Lily thinks certain people deserve to die, and seems willing to help. Serious, not joking. A set-up straight out of Highsmith, but Swanson makes it his own throughout the rest of the book, laying down twist upon twist upon twist as the story heads to the United States and he ratchets up the tension. The best laid plans go awry. Flashbacks flesh out what we know about characters, shifting perspectives, suspicions, and understanding. Just why is Lily encouraging, even pushing Ted to take action? Who is playing who? The line between heroes and villains blurs, morphs, and flips. Swanson adroitly keeps us on our toes. It's hard to talk about THE KIND WORTH KILLING with much specificity without giving too much away about the plot, which is very clever and well-thatched. Murders are planned, committed, and investigated. Tension builds well throughout. There are lots of twists, but even going into the book knowing that, Swanson still manages to surprise. The shifting perspectives between characters could be a clunky format in lesser hands, but Swanson writes with style and a deft touch. 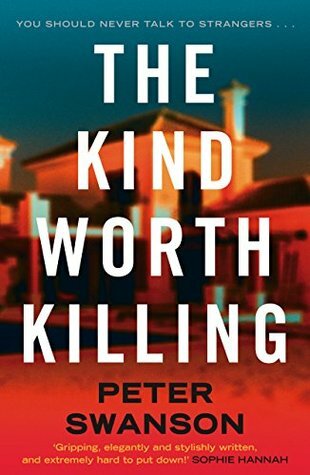 Overall, this is an excellent thriller that's likely to elbow its way into your 'best reads of the year' list.